I was flipping through some old Omni magazines that I'd dug up while cleaning out some boxes, and I found a treasure trove of awesome retro goodness. So, I'm going to start scanning! The first one is the Columbia Video Game Club, much like it's scammy cousin the Columbia House Music Club, except for video game cartridges. At $4.95 A Game You Can't Miss. Just look at the video games offered here... all available for home enjoyment on your Atari® Video Computer System™! They retail anywhere from $26.95 to $34.95 each, yet you can have any one for only $4.95 -- with membership in the Columbia Video Game Club! This is an exciting new service that offers you the newest home video games on a convenient shop-at-home basis -- and at great club savings! How the Club works: approximately every six weeks (up to 9 times a year) you will receive the Club's colorful Video Game Magazine. It announces the Hit Game Selection...generally a brand-new arcade winner. 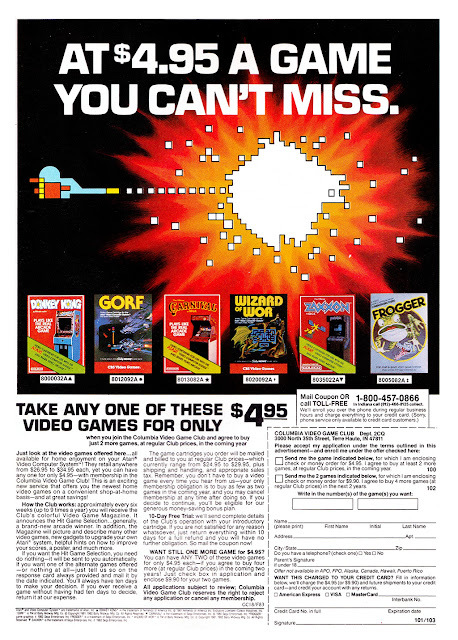 In addition, the Magazine will picture and describe many other video games, new gadgets to upgrade your own Atari® system, helpful hints on how to improve your scores, a poster, and much more. If you want the Hit Game Selection, you need do nothing -- it will be sent to you automatically. If you want one of the alternate games offered -- or nothing at all -- just tell us so on the response card always provided and mail it by the date indicated. You'll always have ten days to make your decision. If you ever receive a game without having had ten days to decide, return it at our expense. The game cartridges you order will be mailed and billed to you at regular Club prices -- which currently range from $24.95 to $29.95, plus shipping and handling, and appropriate sales tax. Remember, you don't have to buy a video game every time you hear from us -- your only membership obligation is to buy as few as two games in the coming year, and you may cancel membership at any time after doing so. If you decide to continue, you'll be eligible for our generous money-saving bonus plan. 10-Day Free Trial: we'll send complete details of the Club's operation with your introductory cartridge. If you are not satisfied for any reason whatsoever, just return everything within 10 days for a full refund and you will have no further obligation. So mail the coupon now! WANT STILL ONE MORE GAME for $4.95? You can have ANY TWO of these video games for only $.95 each -- if you agree to buy four more (at regular Club prices) in the coming two years! Just check box in application and enclose $9.90 for your two games. All applications subject to review; Columbia Video Game Club reserves the right to reject any application or cancel any membership.